Embrace social everywhere. Mirror the increasingly important role of social media interaction in customer communications, enabling internal collaboration that delivers results for external customers. Improve sales efficiency. Speed the production of proposals and improve the sharing of tips and leads within sales teams. Share information. Capture more of the tacit knowledge of the organization — that is, the knowledge not recorded in any formal document — by encouraging communications that are shared broadly rather than trapped in e-mail or discussed only offline. Promote agility. Allow employees to make the connections they need to create workarounds when formal processes break down or to react quickly to unanticipated events or opportunities. Improve the workplace atmosphere. Humanize the workplace and improve morale by encouraging employees to make more varied connections and recognize each other publicly for good work. In the following figure, you see co-workers thanking Celeste, the creator of a helpful sales document. 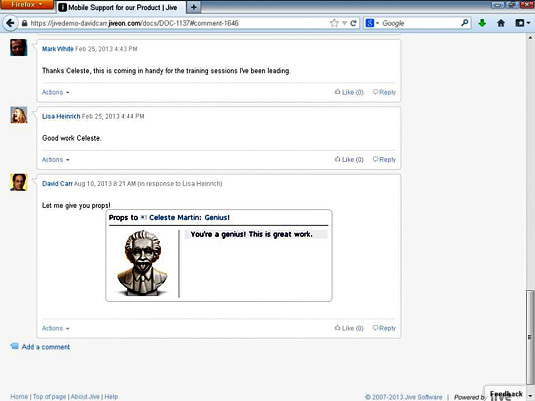 This example is from Jive Software’s social collaboration platform, and the last comment includes a badge, a graphical symbol of recognition, created using Jive’s Props app. Social collaboration gives co-workers many ways to thank each other and recognize excellent work. Coordinate activities. Improve coordination of routine work activities, such as gathering information for a proposal or resolving a customer complaint. Help colleagues connect. Bridge organizational divisions by department, work function, or geography, enabling productive collaboration between employees who otherwise never would have met, even online. 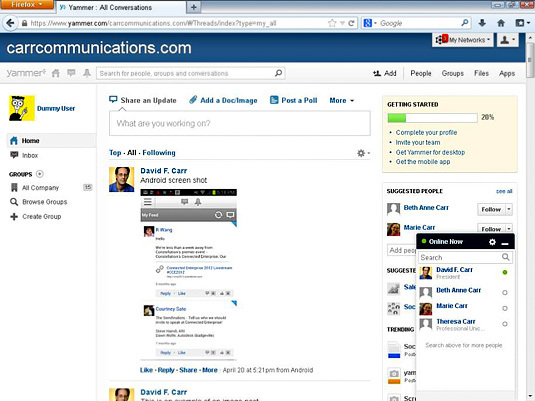 A social collaboration environment like Yammer (see the following figure) looks a whole lot like Facebook. Scratch beneath the surface, though, to find tools that promise secure business collaboration. Here, you can see that Yammer is built around a central news feed, a listing of recent messages, links, and documents shared by co-workers that is similar to the listing of updates shared by friends on Facebook, except that here the context is work rather than play. This user interface format for presenting a stream of messages is also known as an activity stream and can be used to represent all sorts of social and application events. Yammer makes a distinction between the news feed, which is limited to updates posted by people, and the activity feed, which includes automated updates. Other environments mix the two, and the terms are often used interchangeably. One of the most important elements of social collaboration is that you can view a customized and personalized activity stream of all the things that are most important to you. You see the updates posted by your closest collaborators, answers to questions you have posed, and feedback on documents or links you have shared. You pick the people and groups you want to follow, rather than having their messages broadcast to you whether you find them relevant or not. That also means you can share information with the people and groups most likely to care about it, rather than trying to e-mail everyone you can think of who may care, which often means spamming co-workers who don’t care and missing some who do.